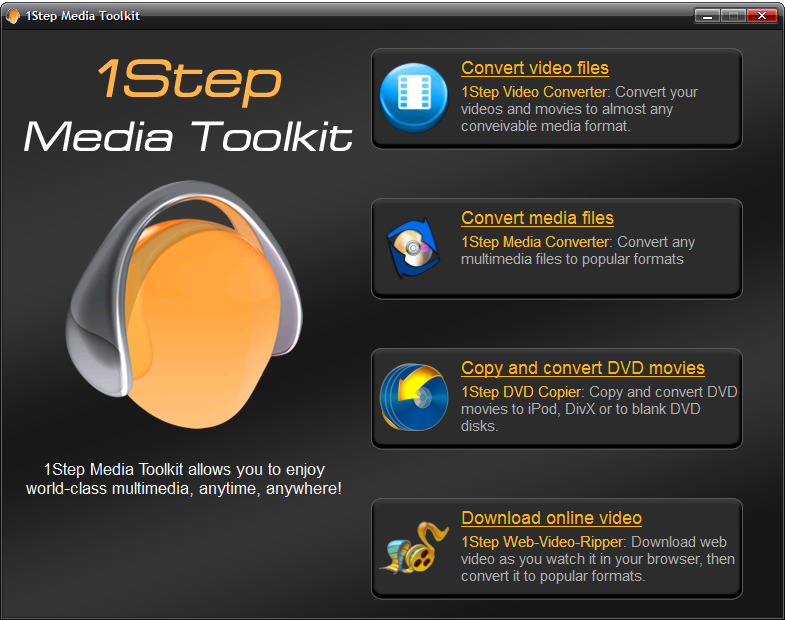 ﻿ 1Step Media Toolkit is the most powerful all-in-one solution, allows you to convert any audio and video files, rip, copy or backup your DVDs. 1Step Media Toolkit contains 4 perfect products in one package to handle any of your multimedia tasks. It includes the most recent and complete versions of 1Step Media Converter, 1Step Video Converter, 1Step Web-Video-Ripper and 1Step DVD Copier. You will be able to convert any music and movies, capture and download any web video, copy, rip and backup your DVDs and much more! Additionally 1Step Media Toolkit offers an incredible discounted price - $49.99. This is nearly a 64% discount from the total price of each product purchased seperately.